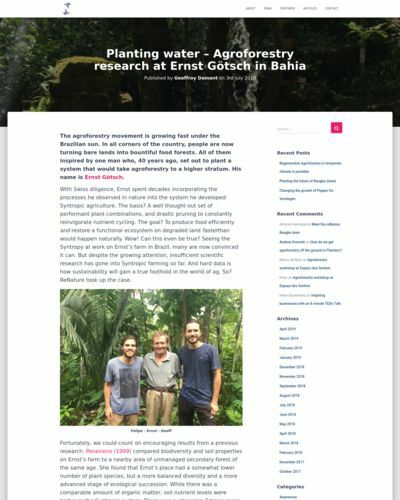 The agroforestry movement is growing fast under the Brazilian sun. In all corners of the country, people are now turning bare lands into bountiful food forests. All of them inspired by one man who, 40 years ago, set out to plant a system that would take agroforestry to a higher stratum. His name is Ernst Götsch. With Swiss diligence, Ernst spent decades incorporating the processes he observed in nature into the system he developed: Syntropic agriculture. The basis? A well thought-out set of performant plant combinations, and drastic pruning to constantly reinvigorate nutrient cycling. The goal? To produce food efficiently and restore a functional ecosystem on degraded land fasterthan would happen naturally. Wow! Can this even be true? Seeing the Syntropy at work on Ernst’s farm in Brazil, many are now convinced it can. But despite the growing attention, insufficient scientific research has gone into Syntropic farming so far. And hard data is how sustainability will gain a true foothold in the world of ag. So? ReNature took up the case.